Agriculture is a component of so many aspects of our lives, even if we don’t realize it. Food is the obvious one, but everything from our clothing, paper and plastic products, makeup, crayons, diapers, medicines, and even those adult beverages we sometimes enjoy are thanks in part to ingredients from agriculture. 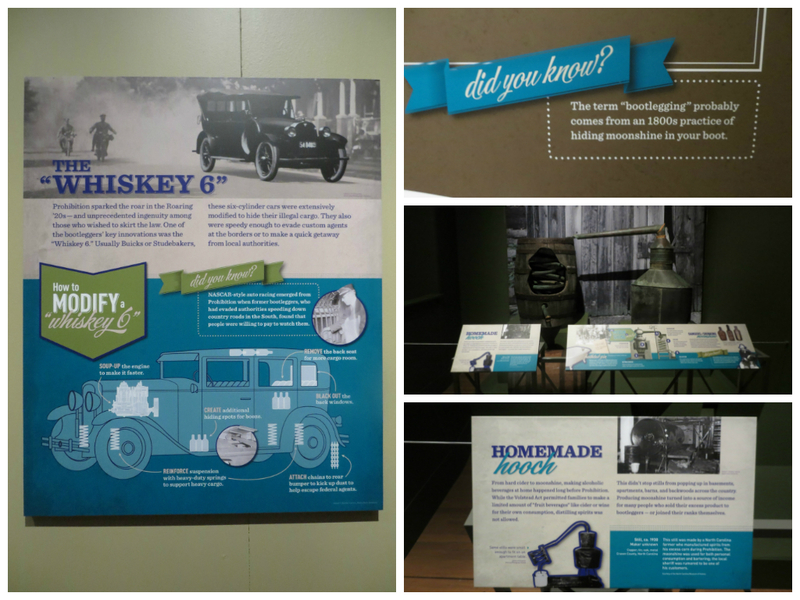 A couple of weeks ago, I had the privilege of previewing the newest exhibit at the Indiana State Museum, “American Spirits: The Rise and Fall of Prohibition.” This era has always been fascinating to me, and I really enjoyed learning more about our country’s history and how the “spirits” of America came to be. 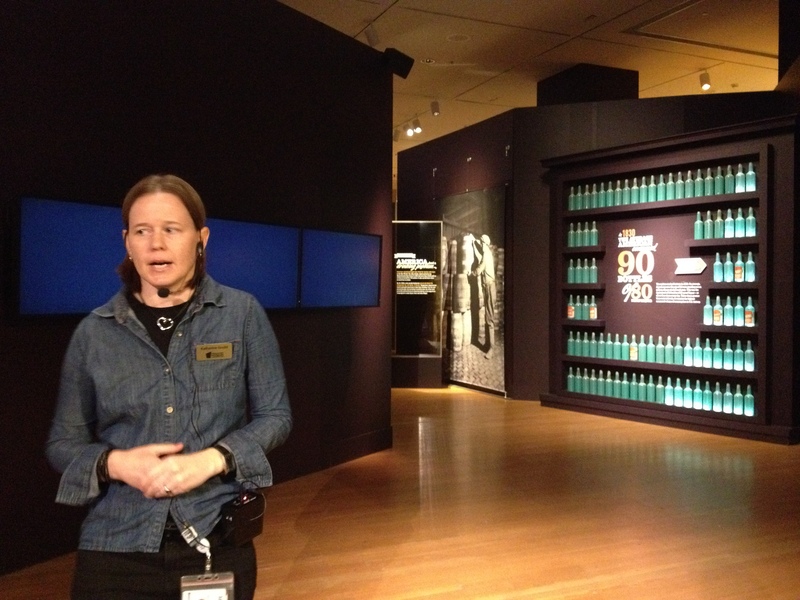 And as promised, I also took the opportunity to focus on how agriculture was involved in the various aspects of the exhibit, the Prohibition era, and the beverage industry in general. I’m excited to share all of the neat facts I learned! The day we visited was the grand opening for the exhibit so they had a little celebration in addition to giving tours through the gallery. We were told we could bring a couple family members and, if we were feeling really adventurous, we could even dress up in time-period clothing! I brought along my cousin, Jennifer, and her daughter, Sofia. Since it was during the day and we planned to go somewhere afterward, I didn’t want to wear the full flapper get-up, but I couldn’t pass up the opportunity to wear some fun 20s-inspired accessories! 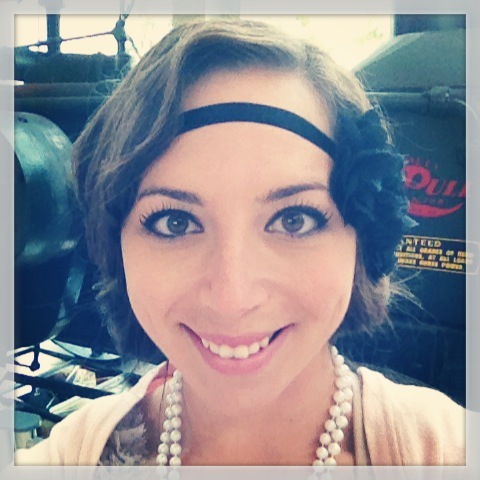 All dolled up with my pearls and pin-curls! 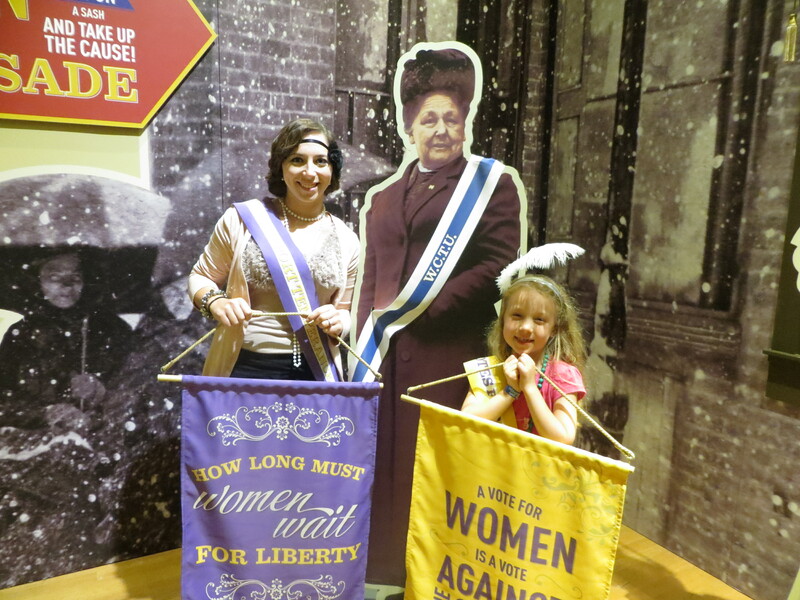 Here my little cousin, Sofia, and I are posed with one of the suffrage women who were a part of the exhibit. I even gave Sofia a fun feathered headband and pearls to wear too. She received so many compliments on her feather! With our outfits on and camera’s on, we were ready to check everything out! One of the museum’s curators, Katherine Gould took us on a tour for the exhibit and was very knowledgeable about the time period. 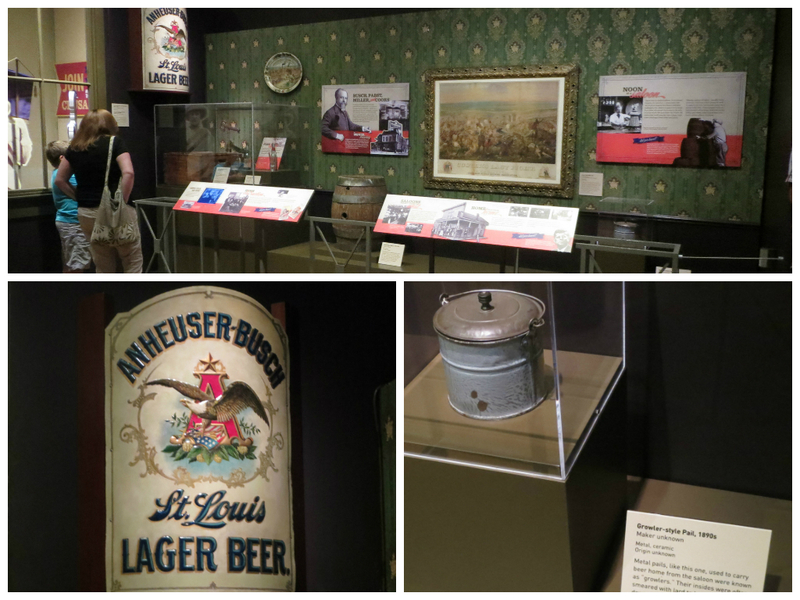 The exhibit starts off by setting the scene to why Prohibition was established. One of the main reasons was because Americans drank VERY large amounts of alcohol during the early 1800s. In 1830, America hit rock bottom. During that time, the average American consumed 90 bottles of 80 proof liquor! That is about three times greater than the current levels of today. 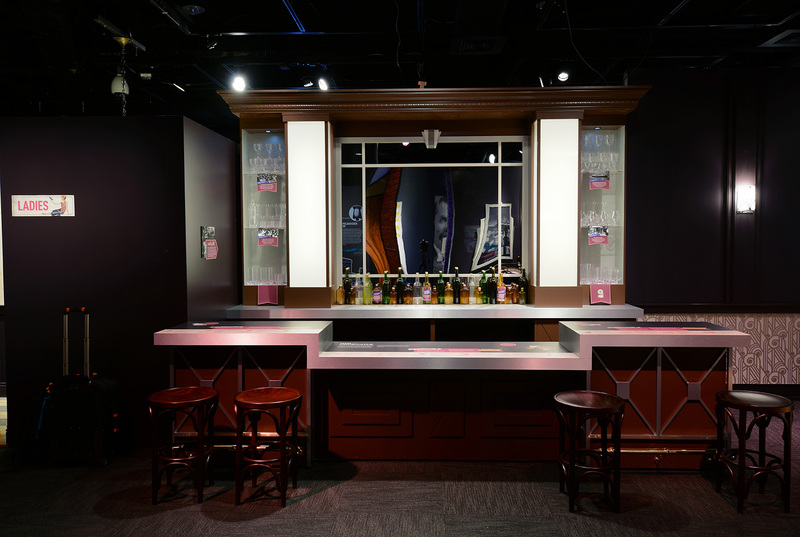 One of the first parts of the exhibit showcased examples of the favorite drinks of the pre-prohibition time period and the current drinking habits. In the rural areas, whisky and cider were the drinks of choice. 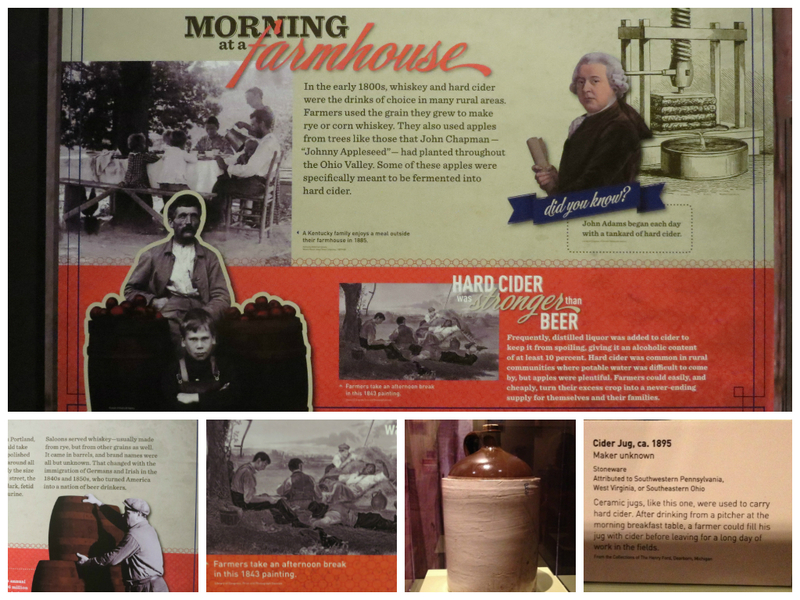 This was because farmers used the grain they grew to make rye or corn whiskey, as well as apples from the area to make hard cider. Hard cider was much stronger than beer. As a way to keep the cider from spoiling, distilled liquor was frequently added to the cider; giving it an alcohol content of at least 10 percent. It was very common in rural areas because potable water was difficult to come by, while apples were plentiful. Farmers could easily and cheaply turn their excess crop into a never-ending supply of cider for themselves and their families. In more of the urban areas, saloons were very popular. 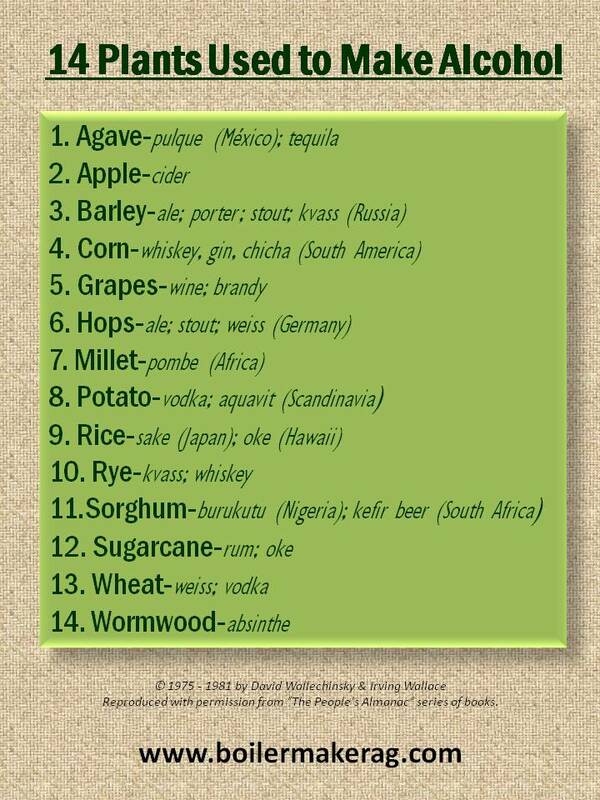 Saloons of that time served whiskey, which was usually made from rye, but could be made by other grains as well. It came in barrels, and brandnames were pretty much unknown. But all this changed in the 1840s and 1850s when Germans and Irish immigrated to America, turning it into a nation of beer drinkers. As more companies started brewing beer, brand names also started to become established. Decorations and furniture in saloons would actually be supplies by breweries in exchange for them selling their beer. From here, we learned about the Temperance Movement and the Anti-Saloon League, which started the fight for alcohol reform and brought the issue into politics, eventually leading to the passing of the 18th Amendment, Prohibition. There was so much interesting information, and we were only to the beginning of learning about Prohibition! If you’d like to learn the whole back story, this website featuring a PBS special on the rise of Prohibition has a lot of great facts. Wayne Wheeler, founder of the Anti-Saloon League, was considered to be the most powerful man in America at one point. 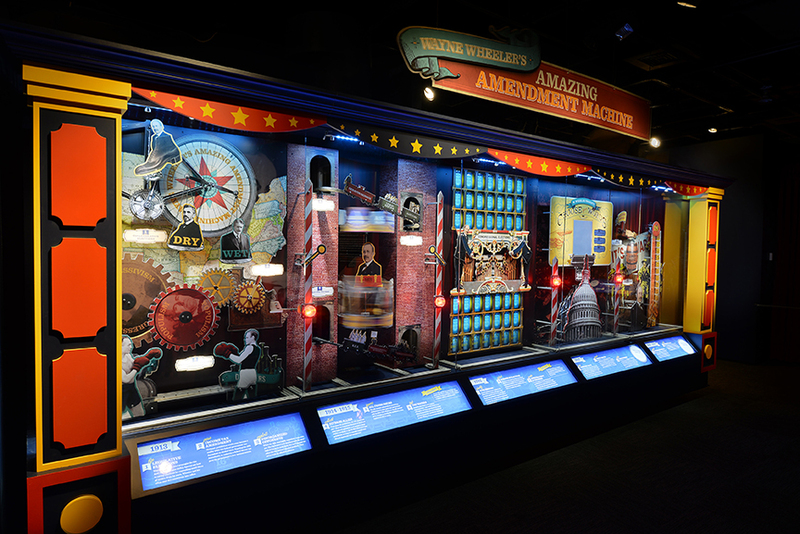 The exhibit features his “Amazing Amendment Machine” which highlights the process by which he and other fighters for reform, worked to get the 18th Amendment passed. On Jan. 17, 1920, the 18th Amendment put into place a nationwide ban prohibiting Americans from manufacturing, selling or transporting alcohol. This time period is commonly known as Prohibition. For the next 13 years until 1933, the “Drys” worked to enforce the amendment, while the “wets” basically disregarded it; leading to the birth of the Roaring ’20s, bootlegging and speakeasies. People decided to start making their own alcohol, which resulted in an increase in moonshine and bathtub gin. In order to transport their alcohol without getting caught, they modified their cars to hide the bottles. One example was the “Whiskey 6” car which had multiple places to store liquor and was adapted to reach higher speeds in order to escape the law in a chase. An interesting fact – the Nascar culture emerged from this vehicle and its ability to go faster than factory vehicles. This part of the exhibit was very neat in my opinion! 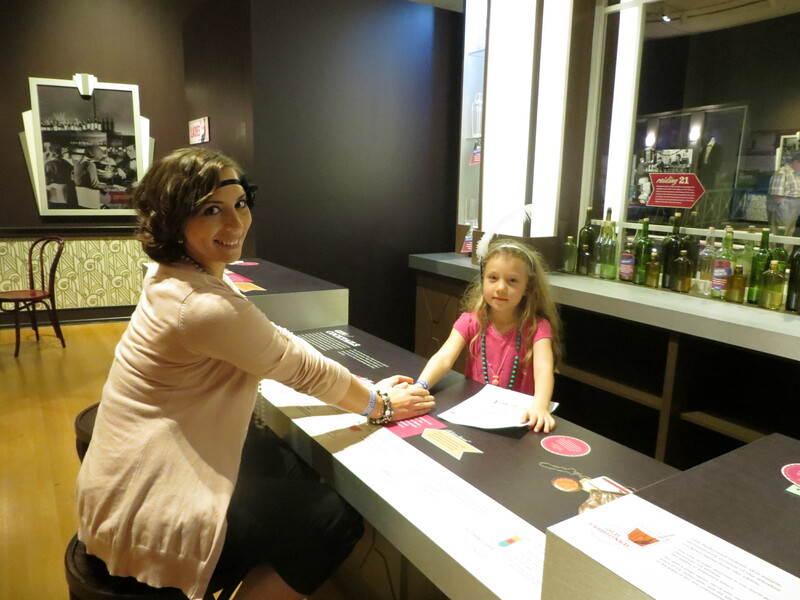 There were several interactive areas where you could test your knowledge about the era, learn if you were a “wet” or a “dry”, learn the 20s and 30s lingo, and even visit a re-created speakeasy! Speakeasies were the time you had men and women drinking together. 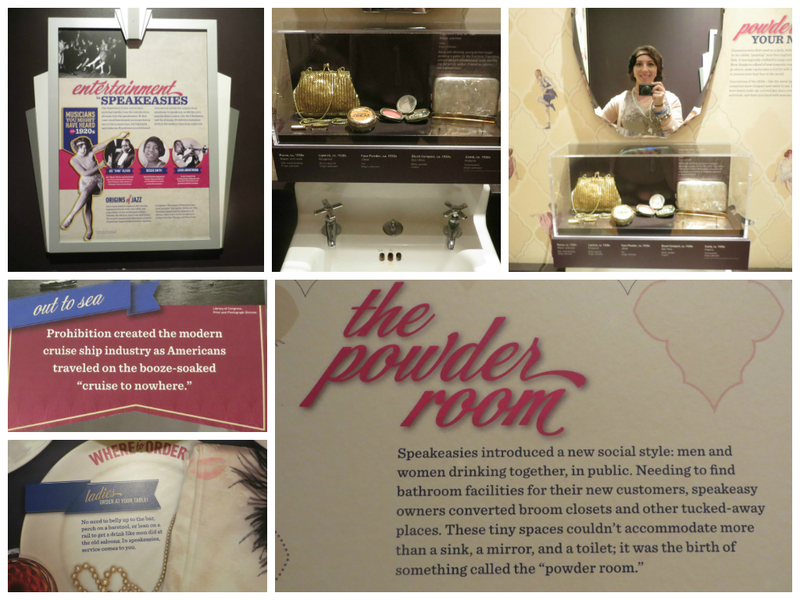 It was during this time that “Powder Rooms” were born, giving women a place to use the restroom and freshen up. 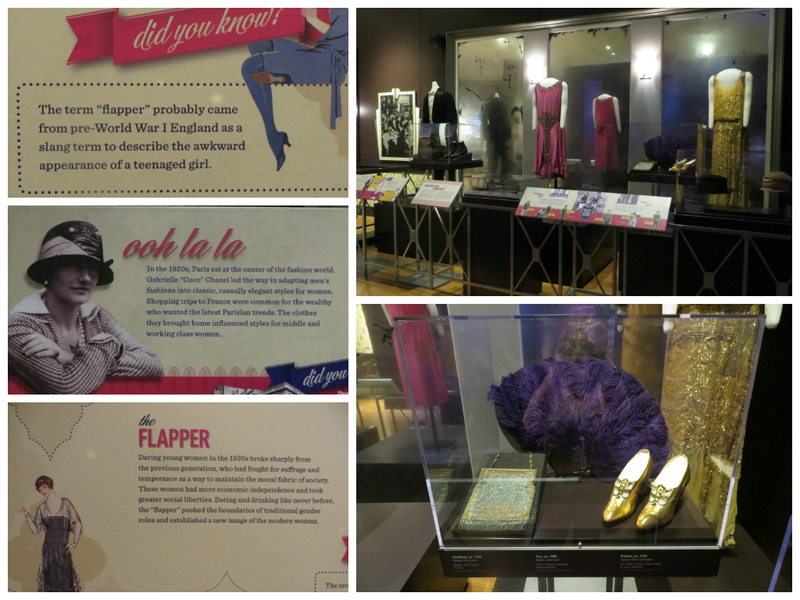 My favorite part of the exhibit was the re-created speakeasy bar! One other thing that was created during the Prohibition era was mixed drinks. Because liquor was typically crudely made, they had to start mixing it with things to mask the strong tastes. The bar featured some of the mixed drinks that were born during this time and created a fun environment to act like you were a bar patron from the time. The bar in the speakeasy. Organized crime was also born during this time period due to people trying to get around the ban on alcohol. The exhibit took you through the rise in organized crime, and even featured an “I’m Got Booked” photo area where you could stand in a line-up with Meyer Lensky, Al Capone, and Lucky Lugiano, and then email it directly to yourself as a keepsake! I tried to blend in with my best “mobster” pose, but I don’t think I’d be that hard to pick out of this line-up. Prohibition, failing fully to enforce sobriety and costing billions, rapidly lost popular support in the early 1930s. 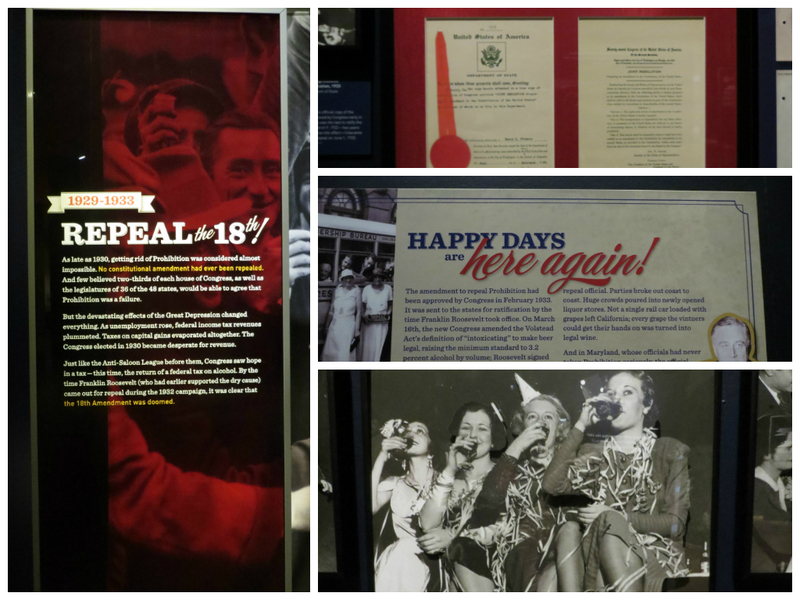 In 1933, the 21st Amendment to the Constitution was passed and ratified, ending national Prohibition. Many Americans were on board with this reversal, farmers included. Pre-prohibition beer making was quite regional. It goes back to the early 1800s from transportation limitations – they could only get ingredients and beer so far. Throughout the 19th and early 20th centuries, beer making was regional and they also used regional ingredients from area farmers. Breweries would actually buy from local farmers. When prohibition was passed, the farmers lost those markets. What’s interesting is, most people focused on the farming disaster that occurred during the depression, but agriculture was going through various droughts throughout the 1920s as well. Throughout the 1920s and 30s, agriculture was bit both by droughts, the depression, and food prices going up and down, as well as lost a huge business for a lot of their grains. So when the idea of repealing the 18th amendment started picking up steam, agriculture got on board. This was interesting because your rural communities tended to be the driest communities. And that’s why they were able to carry a lot of legislatures. But they were also the farmers who needed the market. So a lot of farming groups got behind repeal because they found a new way to market their grains. So it impacted them a lot. When Prohibition went into effect, it put a lot of people out of business. 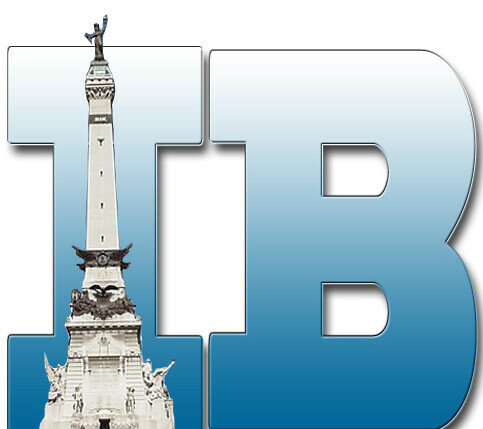 Not only the breweries, but also bar and saloon owners, trucking companies, ice companies, bottle companies, (there a lot of different bottle companies here in the state) lost jobs. Whisky and hard cider were the most popular drinks until about WWI, mid-century with the immigration of German and Irish who brought with them beer, and they made it very well. So that started to become very popular. Indiana actually had a pretty robust distilling industry in Indiana, down by Terre Haute and around the Ohio River, with the access to water, which was very important for that. Indiana actually had the first successful commercial winery in the early 1820s down in Vevay, Indiana. They were able to grow grapes successfully there and did advertising in Switzerland to bring people to come work at their winery. How fascinating! Katherine also told us during the tour that while the “noble experiment” (as Prohibition was eventually known) failed, there were several things that came from it that are still in place today. With the commercial production of alcohol banned, several products were created in its place. Some well-known examples are: Welches grape juice, Vino grape brick, Coca Cola, Root beer, and Koolaid, among many others. In addition to being a prominent part of the “American Spirits” of the Prohibition era, agricultural products are how we are able to make many more of the alcoholic beverages that are enjoyed today. Did you know all of these things are made into alcohol? An incredible diversity of grains, herbs and fruits goes into the world’s alcoholic drinks, which means that for the botanically minded, a trip to the liquor store is a little different than it is for the rest of us. Amy Stewart explains what it’s like in her new book, The Drunken Botanist. This book looks so interesting! I think I may have to make it my next reading project – right as soon as I finish the book I started reading on our honeymoon…almost five months ago. (That’s pathetic, I know.) But seriously though, this does look like an interesting and fascinating read! 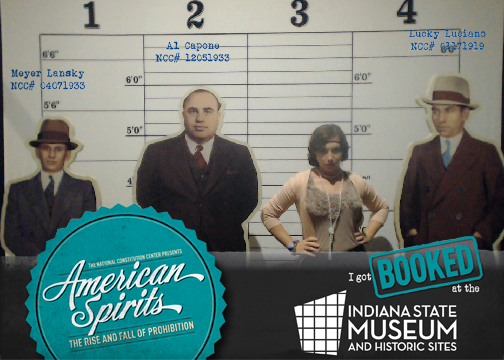 Overall, the American Spirits: The Rise and Fall of Prohibition exhibit at the Indiana State Museum was a great time! 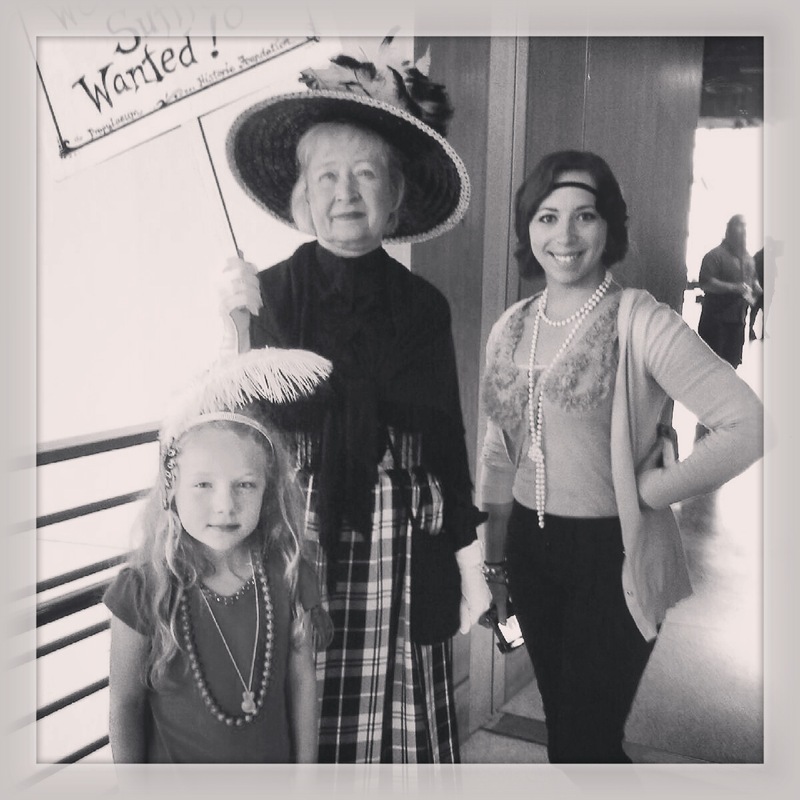 It was very interesting, very interactive, and fun to spend a day back in the Roaring 20s! Jennifer, Sofia and I all really enjoyed the whole day. We also enjoyed learning about how agriculture ties into this interesting era! So next time you pop the top on an adult beverage, don’t forget to thank a farmer! The exhibit is open until February 15th, 2015 which gives you PLENTY of time to check it out for yourself! But I encourage you to stop by while it’s still at least a teensie-bit warm outside, because if you’ve never been to the Indiana State Museum before, it’s right by the canal downtown which would be a nice place for an afternoon fall walk after the exhibit. If you’d like to purchase tickets to experience the “American Spirits” exhibit, they are $13 for adults, $12 for seniors and college students, $8.50 for children ages 12 and under. Member admission is included in membership. For more information about the exhibit, special events, online ticket sales and more, visit indianamuseum.org. Join Rita Kohn, author of True Brew: A Guide to Craft Beers in Indiana; Doug Wissing, author of One Pint at a Time: A Traveler’s Guide to Indiana Breweries; Anita Johnson, owner of Great Fermentations; and Bob Ostrander and Derrick Morris authors of Hoosier Beer: Tapping into Indiana Brewing History to discuss Indiana brewing history and the rise of home brewing and craft beers in Indiana. This events is 21 & over. Reservations strongly recommended. Call 317.232.1637 for reservations. Tickets: $35 per non-member / $25 per member. Price includes admission to the talk, a snack and an admission voucher for the American Spirits: The Rise and Fall of Prohibition exhibit. This event will take place at Tow Yard Brewing Co. While you’re there, don’t forget to post pictures and use the hashtag #ISMSpirits – I’d love to see if you all dolled up in your best 20’s fashion and accessories!